Current European U/22 champion Amy Broadhurst looks like she’s going to get the decision over former Republic of Ireland star and manager Steve Staunton in the Dundalk Democrat All-Time great poll. The 2018 World Elite quarter-finalist is putting the ex Liverpool defender under pressure, as Staunton’s ex Irish boss Jack Charlton might put it. However, the only decision Broadhurst is focused on this weekend is the one on offer versus Clann Naofa BC standout Shauna O’Callaghan. Both women meet in the light-welter semi-finals at the National Stadium tomorrow night with the winner advancing to face defending champion Moira McElligott of the St Michael’s Athy BC on the 80th anniversary of the official opening of the first purpose-built boxing venue in the world in 1939. Broadhurst, who is ranked No. 8 in the world, added to her medal-laden CV last month after taking home her second successive U/22 crown at lightweight but has moved up to light-welter for the Elites. Chloe Fleck and Carol Coughlan kick off the penultimate weekend of the Elite Championships in one of two outstanding quarter-finals on Friday. The Francis BC will be guaranteed a title if uncle and nephew Myles Casey and Tommy Casey beat Portlaoise BC and Drimnagh BC feathers Christian Cekiso and Patryk Adamus and Cork’s World Youth finalist and 2014 Youth Olympian Christian Desmond is in against Tina Donnelly at welter. “It would be nice to win it out, definitely. That’s the plan and we’ll see how it goes at the Stadium, said Macroom southpaw Desmond. Grainne Walsh, the defending titlist who claimed the inaugural Best Female Boxer Award the 2018 Elites, meets Gillian Duffy in the corresponding welterweight semi-final. 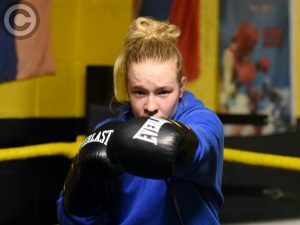 Welter is one of the new Olympic limits for women. The 69kg class and feather have been added to fly, light and middle for Tokyo 2020. The weigh-ins for Friday’s and Saturday’s bouts will be held between 8am and 9am and 12pm at 1pm at the National Stadium. 25 bouts will be completed this weekend to complete the lineups for the finals on Saturday, February 23. Finals night will be broadcast live on TG4. The IABA wishes all athletes the very best of luck at the home of Irish boxing this weekend.